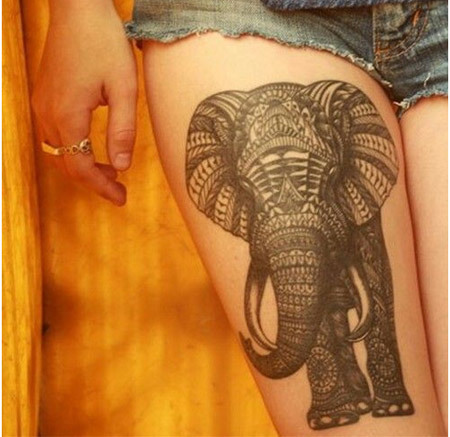 Elephant tattoos have long enjoyed much popularity with a mostly female clientele. 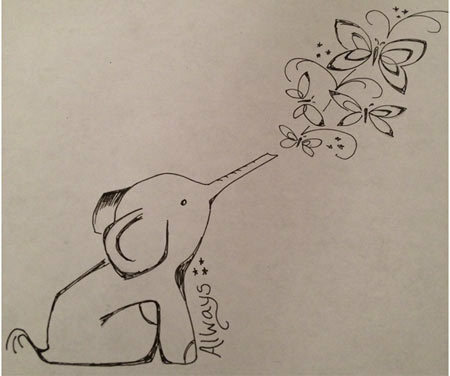 Elephants symbolize noble values such as wisdom, courage, strength and stature. 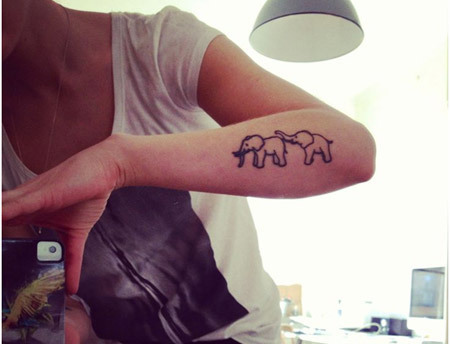 Because of which, many people treasure their elephant tattoos for the positive inspiration it provides on a daily basis. 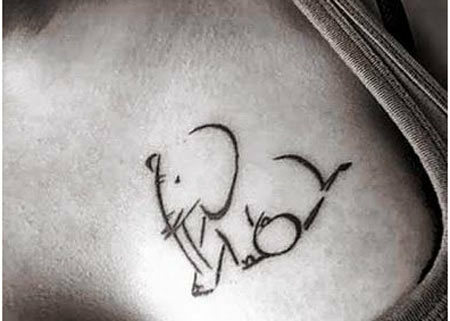 Whether you are looking for artistic inspiration or simply astounding designs, these top ten elephant tattoo designs should go a long way in meeting your desires. 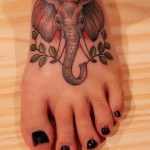 Elephant Feet Tattoo is mostly just an idea of how you can use this design to inscribe tattoos on other parts of your body. Keep it as it on your feet or have it on the nape of your neck or arms for better display. Cute, trendy and small, this tattoo depicting a pair of elephants can effectively adorn the nape of your neck, your ankles or go on to your wrists. Simple and easy to replicate, it may not be much of a problem finding a professional tattoo artist to effectively have this inscribed on you. 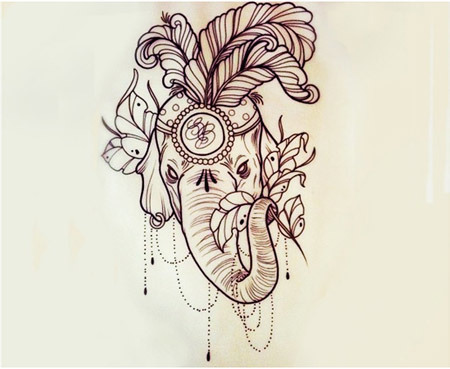 Strikingly similar to the Indian Royal Elephants or the decorated elephants in temples in South India, this tattoo depicts an embellished elephant effectively. Definitely not easy to replicate, it’s best you do your research and find a seasoned expert with a good eye for detail. Make a note of the fine ornate motifs delicately embellished on the elephant. This tattoo is sure to be a huge reason for envious and admiring stares. This tattoo with its old world charm stands out for the intricate use of motifs and design to accentuate the elephant depiction. Make a note of the elaborate feather headgear and the piercing method used. Take a closer look at the initials on the forehead, a great idea to get someone special’s or your own initials inscribed on to your skin without being cliche. 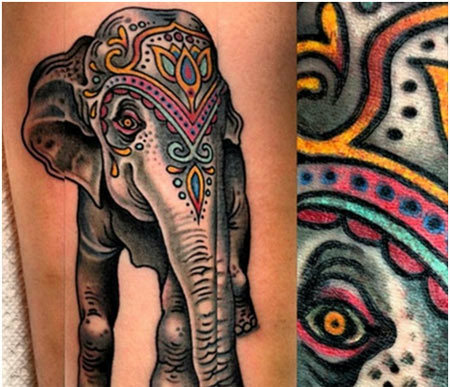 If looking at this awe inspiring Colored Elephant Tattoo has left you awestruck, we don’t blame you. Definitely the work of a seasoned expert, this ornate elephant tattoo stands out for the use of color and intricate detail. Make a note of the effective shading work used that accentuates this piece of art on the whole. 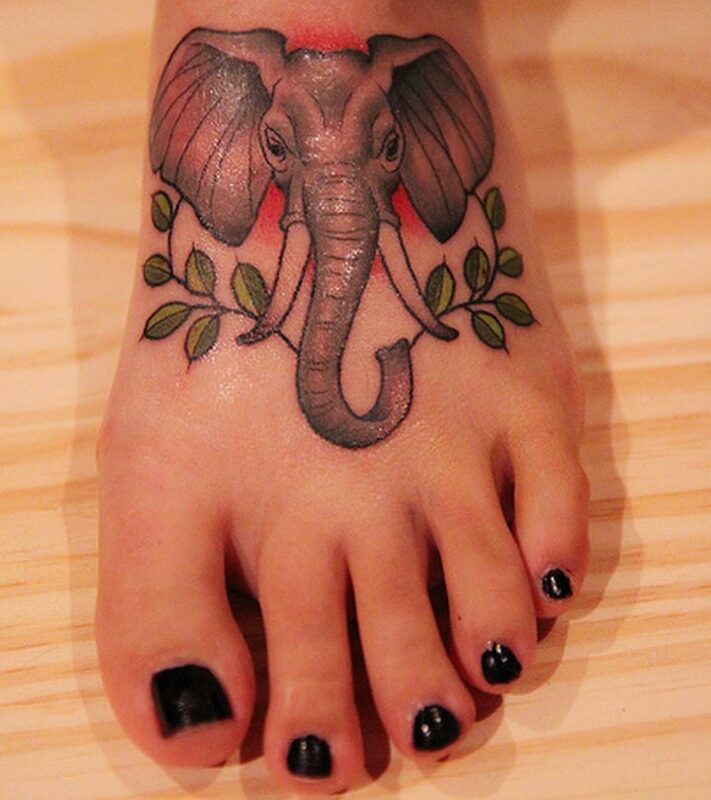 Mostly just an example of miniature elephant tattoos, this tattoo can be interpreted in a variety of ways. 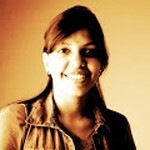 However, it is best to stick to miniature size in bold dark colors. 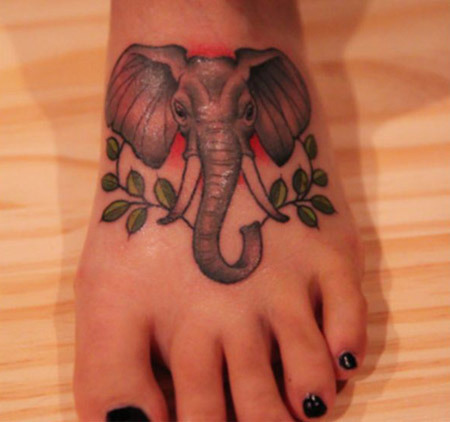 This tattoo idea is an effective example of how you can mix and match elephant tattoos with other floral motifs. Keep it small and simple as possible. However, you are free to experiment with wide range of colors. It’s best to seek out the expertise of a seasoned tattoo expert even with the most simplest of designs so that you get your money’s worth. This tattoo depicts an elephant with butterfly wings. 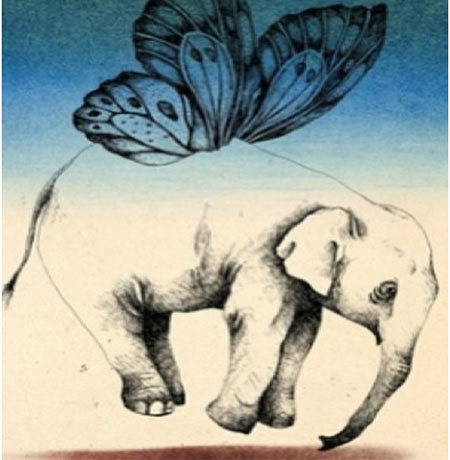 This interesting concept symbolizes power and confidence with the ability to fly and reach out to higher goals in life. As with any tattoo for the upper back, it’s integral to come up with a design that has perfect continuity or a theme. 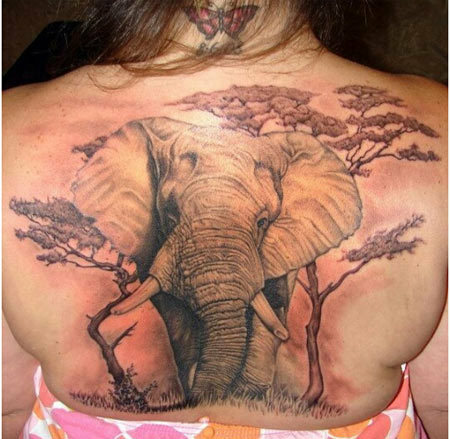 This Elephant tattoo effectively covers the whole back and has an unbeatable theme. This depiction of an elephant foraging in the forests is as real as a photograph. It’s no secret that you would need the services of an expert to replicate this kind of art work. Last but definitely not the least on our list, this miniature abstract elephant depiction stands out for conceptualization and use of bold black strokes. 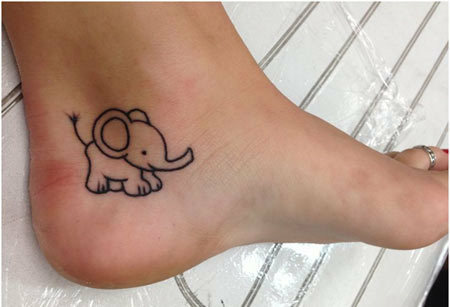 Easy to replicate however it’s best to keep this tattoo elephant small. Hope this article was interesting. As the addiction continues, not just only because of the designs, these tattoos are about life itself. Stay stylish, stay gorgeous. 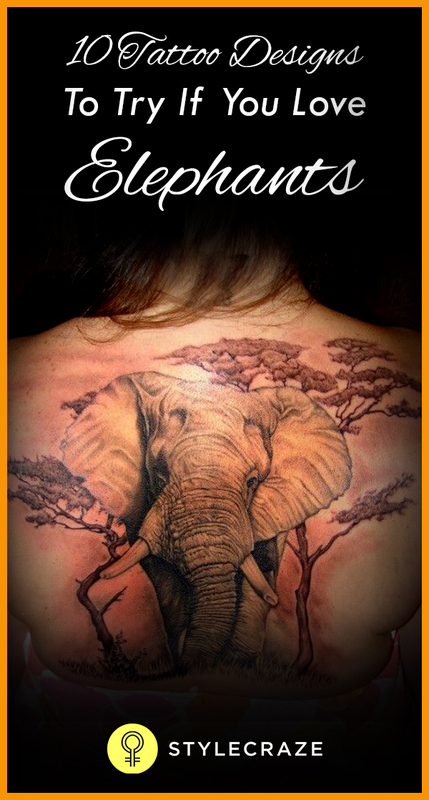 Mark your strength with plenty of elephant tattoo designs that you can find on Tattoos For All.